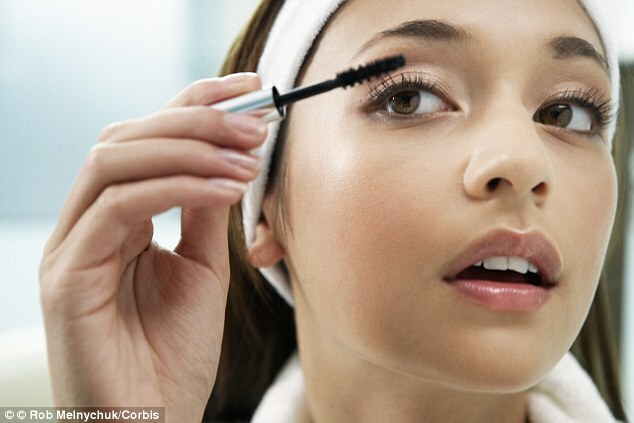 Women are being urged to throw away out-of-date makeup after laboratory tests revealed it contains deadly bacteria - including a strain that causes meningitis. 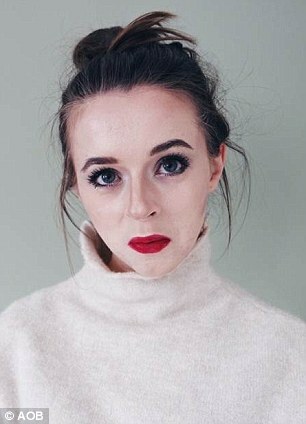 Scientists at London Metropolitan University tested five products including a blusher, foundation and lip gloss and found that old cosmetics contain unsafe levels of potentially lethal bacteria. One of the bugs - enterococcus faecalis - is a main cause of meningitis, which kills more children under five than any other infectious disease in the UK. Other deadly bacteria found include eubacterium, which causes bacterial vaginosis and aeromonas, one of the causes of gastroenteritis and wound infections. Researchers also found staphlyoccocus epidermidis, a nasty bug which is resistant to antibiotics; propionibacterium, one of the main causes for acne and other skin conditions and enterobacter, which causes urinary and respiratory tract infections. The study involved laboratory tests on five beauty products sent in by women and beauty bloggers from around the country. All five products tested - one of which was still in date - contained unsafe levels of potentially lethal bacteria. Four of them - a blusher, foundation, lipstick and in-date lip gloss - tested positive for enterococcus faecalis. 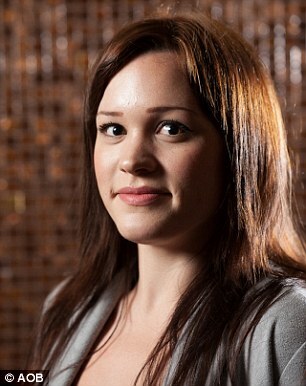 Laura Byrne, 26, sent in a nine-month out-of-date blusher from London. 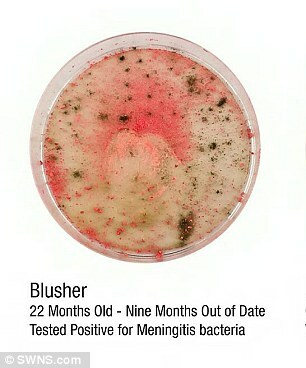 She said: 'I'm absolutely shocked that my blusher contains bacteria that could cause meningitis and septicaemia. 'I was aware that I had kept it well past its use by date but didn't think for a minute that a blusher to contain killer diseases growing in it. 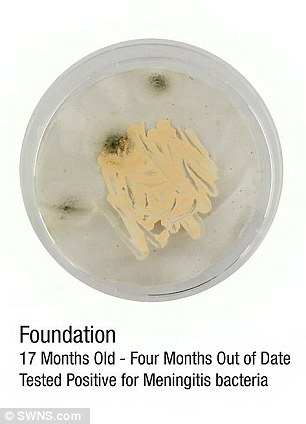 A four-month out-of-date foundation was also sent in by Grace Day, 22, from Manchester. She added: 'I try to get my make-up in date, but I thought it wouldn't matter if it was a few months over, clearly I was wrong. The research was commissioned by online beauty retailer www.escentual.com and involved several high-street beauty products. CEO Rakesh Aggarwal said: 'Most women are totally unaware that their cosmetics are a potentially breeding ground for deadly bacteria. 'But if you think about it you wouldn't keep food for months after the use by date so why should this be acceptable for cosmetics. 'This research has even surprised us and has shown that there is a serious health risk here. 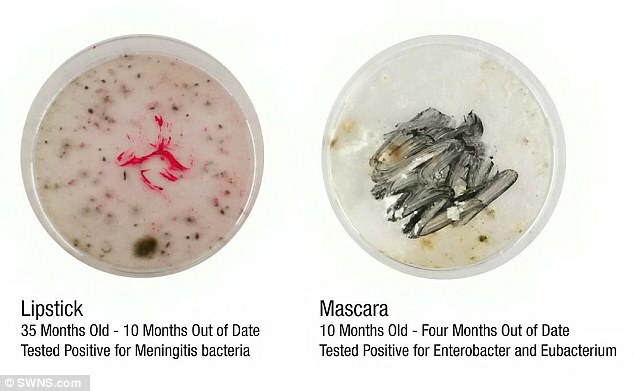 In total six different types of bacteria were found on the five types of everyday high-street cosmetics that were tested. Microbiologist Paul Matewele from the London Metropolitan University confirmed the test results. He said: 'All the old make-up products of foundation, lip gloss and lipstick tested positive for Enterococcus faecalis under strict laboratory tests. Staphlyoccocus epidermidis - a nasty bug which is resistant to antibiotics and is deadly for people in hospital or who have catheters or surgical implants. Enterobacter – causes urinary and respiratory tract infections mainly in hospitalised patients with compromised immune systems. 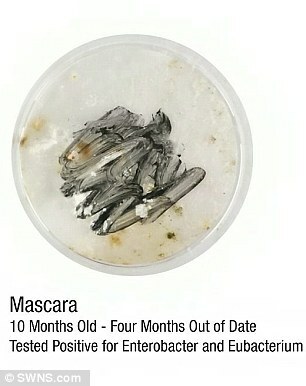 The blusher which was nine months out of date - had largest amount of bacteria, and the mascara four months out of date had the second largest amount of bacteria. 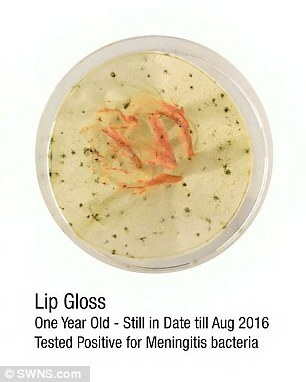 But the lip gloss which was still in date (but was over a year old) had the third most bacteria, it was thought that lip gloss might be prone to more bacteria because it was applied to the mouth, where a lot of bacteria reside. 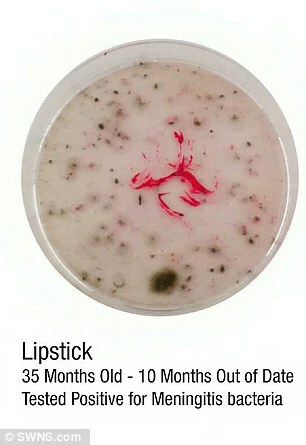 The foundation which was four months out-of-date had the forth highest amount of bacteria and the lipstick was 10 months old but had the least amount. In the case of lipstick it is generally applied less often than lip gloss which may account for the reason it had less bacteria, but all the products tested positive for levels of germs. Transfer of the germs is most likely when come into direct contact – kissing would be the easiest way to pass on the germs and the bacteria are most likely to attack young children, babies or people in hospital whose immunity is compromised. Petri dish appearance: The beige colour foundation was smeared in the middle of the dish, three very large colonies of black bacteria have formed, the largest right on the edge of the foundation, there are also tens of smaller colonies dotted all over the surface of the agar jelly. 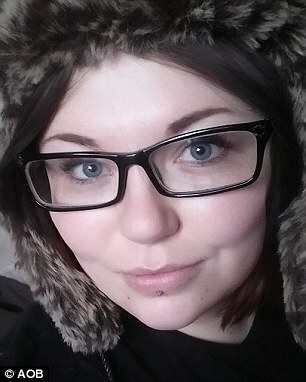 Sent in by: Nikki Capp, 23, from Cardiff. Petri Dish Appearance: The pink colour lip gloss was smeared in the centre and there were nearly 50 colonies of black bacteria growing in and around the make-up. 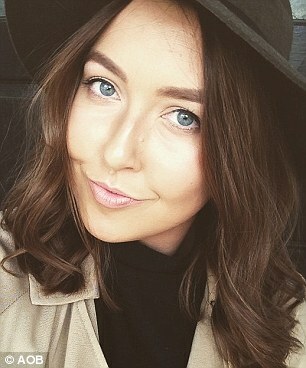 Sent in by: Laura Byrne, 26, beauty blogger from London. Potential diseases Caused: Neo natal meningitis, septicaemia, urinary tract infections, other potentially life threatening infections to hospital patients which are immune to anti-biotics, and acne and other skin conditions. Petri Dish Appearance: The blusher was discoloured, most of the powder has turned livid pink, only some remains in its original colour and over 20 colonies of black bacteria were formed. 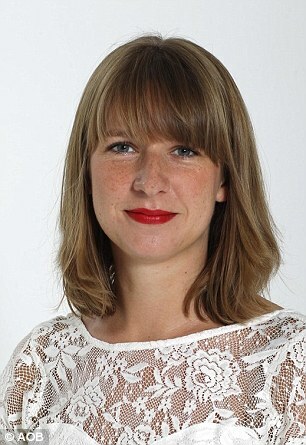 Sent in by: Ella Buchan, 35, beauty and lifestyle journalist from London. Petri dish appearance: The pink lipstick was smeared around the centre of the dish and lightly around the whole surface of the dish. One very large colony of black bacteria has formed and nearly 40 other smaller colonies of bacteria are spread all over the surface of the agar jelly.